James Miller proclaims that his intentions are literary when he provides epigraphs to Milton and Conrad at the beginning of Sunshine State. I was intrigued: Was Sunshine State one of those rare thrillers that transcends genre and achieves true literary value? Sadly, this is not the case. In fact, the quotes set up what might have been a good thriller for almost certain disappointment. The novel begins in the usual way: Because of global warming, the tropical and subtropical regions of the planet have become a hostile ‘storm zone’. To complicate matters, many governments are in the hands of religious fundamentalists. Those who flee persecution often end up in the Zone. Mark Burrows, a retired agent of the British special forces, is called on to undertake a final mission, one that will take him to the southern United States in pursuit of ‘Kalat’, a former special forces agent who is now a dangerous leader broadcasting from deep within the Zone. Because of the epigraph from Conrad’s Heart of Darkness, it’s clear that Miller intends to parallel Burrows’s mission through a storm-despoiled Florida with Marlow’s journey down the Congo. Kalat is Kurtz, the ill ivory collector of Conrad’s story. These are only shallow likenesses, however. Miller juxtaposes the present action with scenes from the past—therapy sessions in which a shell-shocked Burrows recounts his harrowing experiences in the field. Just as this device wears thin, Miller abandons it. The fact that it isn’t further utilized, however, raises questions about why it’s there in the first place. Throughout the second half, he intersperses inscrutable poems that serve no clear purpose. Sunshine State resides between two genres. Unfortunately, the best features of both are lost. Miller relies too much on the familiar formulas of the thriller. But where his ambitions might have raised the story, he has merely attached vague ideas about what he thinks it is to be literary: an epigraph, allusions to past works, inscrutability, all of which keep Sunshine State shackled. 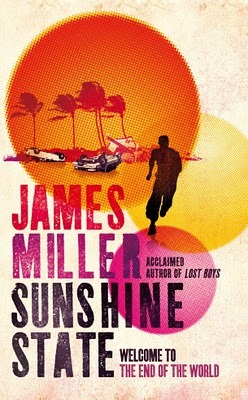 Sunshine State, James Miller, Hachette Australia.